Getting older, poor diet, lack of exercise, and sun exposure can cause the skin to age, leading to wrinkles, fine lines, under eye dark circles, age spots, patches, sagging skin, and other symptoms. But products that moisturize and protect the skin can help treat the signs of aging and prevent more damage from occurring. 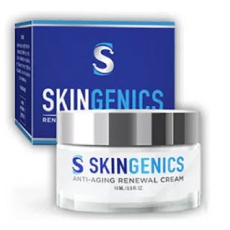 Skin Genics is an anti-aging cream made from all-natural ingredients that you apply directly on to your skin. It’s specifically designed for people older than 30 and suitable for all skin types. Who is the Manufacturer of Skin Genics? The name of the manufacturer is the same as the name of the product: Skin Genics Anti-Aging. They have an official website where you can order a free trial of the product. There is a customer service email available, but no active social media accounts. However, there’s little information on their website or elsewhere about the history of the company, if they make other types of supplements and creams, and how they research and develop their products. How does Skin Genics Work? The cream works by repairing and rebuilding the structure of the skin, providing moisture so it feels hydrated, soft, and smooth. The product boosts your skin’s production of elastin and collagen, leading to better skin texture. Elastin is a protein that helps the skin stay elastic, or stretch. Collagen is a protein that gives the skin strength and firmness. Skin Genics Ingredients – Are they Safe & Effective? What are the Advantages of Skin Genics? What are the Disadvantages of Skin Genics? How should You Take Skin Genics? Test a small part of your skin the first time you use Skin Genics to see if you have a reaction. Talk to a dermatologist if you have any discomfort, tingling, redness, or other symptoms. Before you use Skin Genics, wash your face with a cleanser. Then, dry your face with a towel or washcloth. Follow the directions on the package of Skin Genics. Place the recommended amount of cream on your face and neck, massaging it gently into the skin with your fingers. How much is Skin Genics? A risk free trial is available, but plan to pay for shipping and handling. The product is available for shipping nationwide. You can order it on the Skin Genics free trial website. Expect it to arrive by mail in four to five business days. The actual cost of the product isn’t available online. What Kind of Reviews are Out there for Skin Genics? Some reviews of the product say that it works well and reduces signs of aging to make skin look younger. One review said the product restored her skin to what it was like when she was in her 20s. But other reviews said that product’s effectiveness was outweighed by the difficulty ordering the product and then canceling a subsequent subscription. A skin care routine with a topical moisturizing cream can help address the natural signs of aging and protect the skin from further damage. The ingredients in Skin Genics may make the skin stronger, more elastic, firmer, smoother, and more hydrated. But the lack of information online about the company that makes the product mean it’s hard to know if this offer is too good to be true. Hence, it is recommended to research more about the product before investing money on it.